WhatsApp Messenger has been in the news for multifarious reasons and one of them is definitely the blue tick. What is this blue tick?> We already have an article on WhatsApp blue ticks but let me recapitulate this for new users. The blue ticks feature has been added in order to let a user know that the recipient of his/her sent message has read the message. 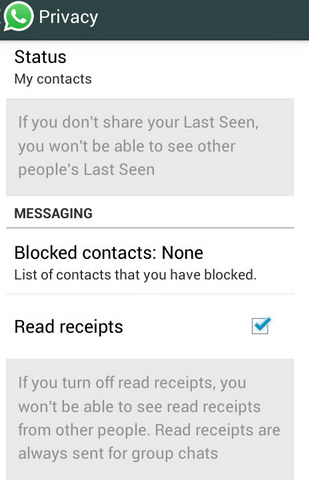 WhatsApp beta for Android is now adding this feature to enable or disable “read text” blue ticks. Previously there were one single tick and double tick. The single tick ensured that the message has been sent successfully but not yet delivered and the double ticks symbolized delivery. But unlike Viber or Hike there was no option to inform the message has been read or not. So it was easy to deceive. Hence this raised a rage of cynical feedback that WhatsApp beta for Android has brought the feature to disable blue ticks. You can download the beta version 2.11.444 of WhatsApp messenger and then go to Settings. You can edit the Profile settings, enable or disable “Read Text” feature. WhatsApp has recently exempted the developing countries from payment of subscription for the application. This is definitely a positive initiative by WhatsApp to finesse its already popular platform.